Christine became an avid follower of Formula One after getting a taste of the action way back in 2003. 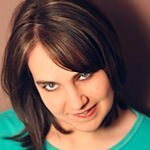 Today, you'll find Christine putting her experience to good use as writer and producer of the news show F1Minute, and editor of community F1 site Sidepodcast. The 2012 F1 season has been closer than anyone could have possibly anticipated, and in the European Grand Prix this past weekend, we saw a great example of just how tight the field really is. The difference between the top thirteen drivers in second qualifying was less than three tenths of a second - the slightest mistake could prove to be very costly. In the final qualifying shootout, Sebastian Vettel stormed ahead by three tenths, but behind him, the drivers remained incredibly close. A tenth here, a tenth there, this is where mistakes are really starting to prove costly, and it’s never more obvious than in the midfield. There’s no such thing as a typical weekend in Formula One anymore, but Force India have managed to prove themselves distinctly average so far this season. Valencia proved to be a great demonstration of the challenges that face a midfield team in the current F1 climate, and the small triumphs that have to be taken wherever possible. 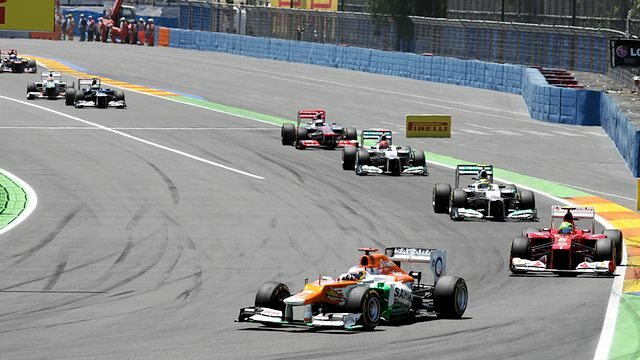 In Canada, Force India just missed out on points with the drivers finishing the race 11th and 12th. They were disappointed and went away determined to learn from the event. 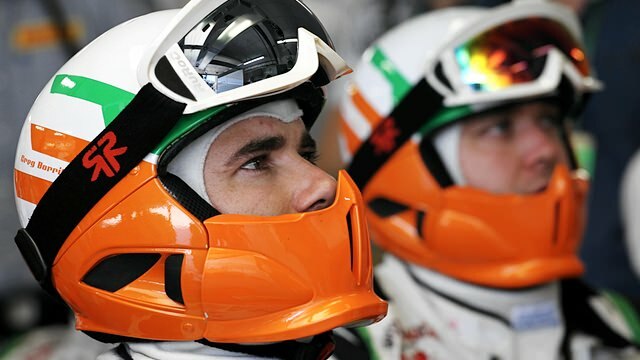 They showed increased pace during the first practice sessions, with Paul di Resta finishing P6 in both FP1 and FP2. Reserve driver Jules Bianchi was given some seat time in the first session, finishing way down in 15th position, but when Nico Hülkenberg regained his vehicle for ninety minutes in the afternoon, he moved up to finish the day second fastest overall. A reasonable start to the weekend for both (or all three) drivers. When I got in the car this morning the baseline set-up was a good starting point and I didn’t really change that much for the rest of the day. Our single lap speed looks strong, as does the long run pace, and we appear to have a good feel for the tyres already. Final practice on Saturday was a similar story, with Nico finishing the hour in P4 just one place ahead of teammate Paul. They dived into qualifying headfirst, but then things went a little bit awry. The track temperature was creeping up and up, and a balance needed to be struck between qualifying well and saving the tyres for the race the following day. While all eyes were on Mark Webber suffering mechanical trouble and failing to get out of the first session, both Force India drivers quietly made their way through. In Q2, Hülkenberg loitered near the drop zone and was pushed out by Fernando Alonso. He improved to fifth, Di Resta also remained in the top ten, and they sailed through as the Ferrari drivers dropped out. For the third and final session, both Force India drivers completed one installation lap early on, before waiting for a single shot at a timed lap towards the very end. The pace wasn’t quite there for them, although Nico appeared contended with his P8 position. Paul di Resta had to settle for 10th place, admitting that he made a mistake that had cost at least a couple of rows on the grid. I think overall it’s a great result for the team to get both cars into Q3, but maybe we were hoping for a little bit more than P8 and P10, especially considering how we have performed so far this weekend. I don’t think the increase in temperatures helped us because the car felt more difficult to drive today and a bit nervous at times. If the warm conditions caused trouble on Saturday, it was bound to be an issue come race day as well. The track temperature was measured at 45°C ahead of the start, and just a few laps into the Grand Prix, both drivers were being warned to watch their brake temperatures and tyre degradation. Both cars started on the softer compound, as did the rest of the top ten. The first pit stops came on lap 11, with Nico Hülkenberg diving in for his first visit on lap 15. Such an early stop indicated that they’d put the German on a two-stop strategy. Which strategy to choose had been a big concern of the teams overnight, with most suggesting it would be two or three. Pirelli boss Paul Hembery indicated that he expected the majority of the field to visit the pit lane for fresh rubber at least twice, as the soft compound combined with the higher temperatures would make for significant degradation. However, Force India weren’t happy to settle with following the rest of the field blindly. They opted to put Nico on a two-stop strategy, but split the difference and kept Paul di Resta on a one-stop. As the race unfolded, it became clear that he was the only driver who was attempting the one-stop strategy. He completed 23 laps on the soft compound, before switching to the medium rubber for the remaining 34. Unfortunately, the strategy was compromised somewhat by the Safety Car period - something that was likely not figured into the plans as it was only the second SC deployment since Valencia joined the calendar. Five laps after Di Resta bolted on fresh tyres, when he really could have done with making the most of the improved grip, he was forced to slow and sit in the train of cars. The new Safety Car regulations have also extended the period circling at such a slow pace, as the backmarkers try and sort themselves into some kind of order. Those at the front managed to take their pit stop during the enforced snail’s pace, but Di Resta was forced to sit and wait it out. Had the Safety Car not come out when it did, we may have seen him move forward further as others pitted and came out behind him. Nevertheless, the one stop strategy saw him finish seventh, picking up a few points for a hard afternoon’s work. The preferred two-stop option turned out to be the best choice of the day, as Nico Hülkenberg came in fifth to secure a healthy ten points for his championship campaign. Fifth place is Force India’s best result since Belgium 2010 (also a fifth), and the combination finish is their best for even longer. The double finish also adds to the team’s consistency record - with just the one retirement in Australia so far in 2012. Post-race, it also emerged that Nico’s finish came with a slight disadvantage. It was a strong result for Force India, one that will boost their morale considerably after falling outside the top ten in Canada. They wanted to improve from Montreal, and they have. The pace seemed to be far better than we’ve seen of late, and they moved to the periphery of the top runners, rather than being stuck securely in the mid-field. This time, splitting the strategy worked out okay, as both options came home within the points. Taking risks can be a dangerous business in F1, but when the field is so close, and there are so many competitors who can do exactly what you can do, you have to head for the differentiating factory. 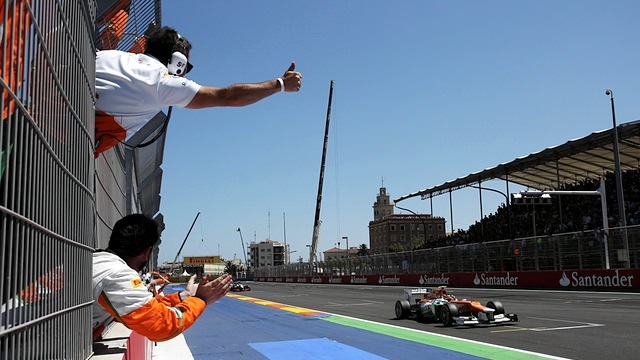 For Force India, that was a one-stop, and let’s hope we see more of this bravery in the remainder of 2012.